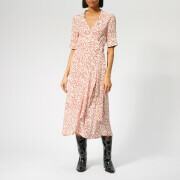 Women’s ‘Charron’ midi dress from Danish fashion house, Ganni. 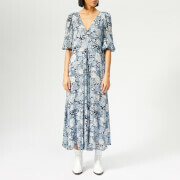 Cut from a light cotton blend, the blue dress features a V neckline created by a wrap over front, which is secured at the waist with a self-tie for a flattering silhouette. Ruffled trims throughout create texture and movement. ¾ length sleeves. A bold check print adds the finishing touch to the design.